Sometimes all we want is the best camera that will let us just point and shoot – these are the devices for precisely that. Some would argue that the best camera is the camera phone in your pocket but a dedicated camera is still an excellent choice is you want to snap something simple on the go. That's because the best point and shoot cameras boast better image quality in all kinds of light, come with zoom lenses for easier composition and give you more creative control over your photos, while remaining just as easy to use. Below are the best point-and-shoot cameras around, as well as the best prices. Our price tracking tool will pull in today's best offers, so you can be sure you're seeing the cheapest point-and-shoot camera prices and best camera deals available anywhere. So what's the best point and shoot camera right now? We think it's the stylish Canon IXUS 185, aka the Canon ELPH 180, which gives you 20MP and an 8x zoom for a very affordable price. But camera manufacturers have upped their game to compete with smartphones, cramming in more features and specs than ever before to provide not only a convincing alternative, but also a reason to exist in the first place. And that means there's a lot of choice out there. Canon has been pushing its digital IXUS range for over 15 years now (called ELPH in the North America, and while each version has become a little slimmer and more refined, they’ve essentially remained stylish point-and-shoot cameras that will readily slip into a pocket and won’t break the bank. What we get here with the Canon IXUS 185 / Elph 180 is very much a beginner’s model, delivering 20MP from a relatively small 1/2.3in sensor. The zoom offers a respectable 8x optical range, starting from a usefully wide setting equivalent to 24mm, though light sensitivity runs from just ISO 100 through to ISO 1600, with the camera limiting itself to a maximum ISO 800 when left on Auto setting. Even with the Program mode implemented, operation remains pared back, although there are some creative digital filter options available for anyone choosing to dig deeper into the menus. So, no prizes for specs, but for this kind of money the Canon IXUS 185 does pretty much all you would expect. Any point-and-shoot compact worth its salt has to differentiate itself from what a smartphone can do. The most useful advantage it can offer is an optical zoom of at least 10x, which is exactly what the Sony Cyber-shot WX220 provides, its lens spanning a focal range stretching from 25-250mm (in 35mm terms). It may not otherwise have that many frills, and the 2.7in LCD screen seems a little small compared to what’s out there in the rest of the market, but what it does, it does well, with images turning out bright and punchy with a decent level of detail. If you want a small camera with a bigger-than-average reach, the WX220 is worth a look. It may be diminutive, but the 20.3MP Canon PowerShot SX740 HS has a lens reach that outdoes what most professionals can achieve with their DSLRs, offering a focal rang equivalent to a whopping 24-960mm in 35mm terms. Also very useful here is an LCD that can be flipped to face the front, and thus the intended subject. Unsurprisingly, we also get a host of selfie-friendly shooting modes, although the camera still offers plenty of control for times when you need to intervene, with the usual PASM suspects selectable via the mode dial. You also get the ability to shoot 4K video (if you can make do with just Full HD the previous version Canon PowerShot SX730 HS may be found slightly cheaper). Autofocus performance is very good, however, as is image quality. Overall, this is a point-and-shoot camera with plenty of punch. A big zoom reach always used to necessitate a big camera. 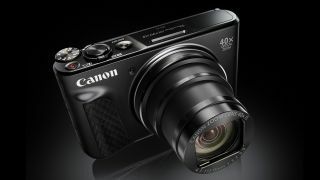 The Canon Powershot SX430 IS, however, proves this is no longer the case, offering a best-of-both-worlds solution. Resembling a DSLR that’s been shrunken, the SX430 IS is much smaller in person than it appears in publicity shots; we struggled to wrap more than two fingers around its handgrip. Yet, impressively, it still manages to provide a 45x optical zoom, starting out at an ultra-wide 24mm, which very much makes is a good option for all eventualities. It's a pity that the LCD screen is fixed and that there is no EVF, but these are inevitable compromises in order to achieve its compact size (and, thankfully, a regular SD card is the media of choice here rather than the fiddly microSD). The lens is a little noisy in use as it travels through its zoom range, and the 0.5fps burst rate means it's not necessarily the best choice for action, but in terms of image quality the camera acquits itself very well for a small-sensor model. Panasonic’s long-running ZS series always offers a capable choice for those seeking a fully-featured pocket camera for the holidays or occasional city break, and the Lumix ZS70 – also known as the TZ90 – is no exception. This Wi-Fi-ready point and shoot camera boasts enough control to satisfy a broad range of users, with the creative advantage of a 30x optical zoom plus Raw shooting, and it performs well in terms of both stills and video (with 4K offered in the case of the latter). A nice little touch is the inclusion of an electronic viewfinder – even if it is tiny – just above the LCD screen, as well as a lens control ring. The camera’s 49-area autofocus is pretty reliable and speedy enough, while image quality is generally very good, with the metering system balancing a variety of scenes. In short, the ZS70 is a good all-rounder that won’t weigh heavily on your pocket – in every sense. The Canon PowerShot G9 X Mark II is a rather sophisticated looking (and featured) point-and-shoot camera, courtesy of its rather minimalist yet traditional appearance and streamlined controls, which have the benefit of keeping this one’s chassis endearingly dinky. Despite this, it's something of a beast under the bonnet, with a 1in sensor paired with a wide-angle 28-84mm equivalent lens, whose maximum aperture at wide-angle is a respectable f/2. There's no viewfinder, but the 3in LCD on the rear also responds to touch, which again ensures that physical controls can be kept to a minimum. To sum up, this is a neat-looking, well-specced compact camera that can produce vastly superior images to a smartphone, which justifies its place in the PowerShot lineup. Panasonic has furnished a number of its Lumix models with 1in sensor, and the LX15, which goes by the name LX10 in some territories, has the added bonus over the PowerShot G9 X Mark II of 4K video recording. Additionally, the lens starts out wider too, at a setting equivalent to 24mm rather than Canon's 28mm. OK, so there is no built-in EVF, plus the smooth finish to the body – while contributing to it looking stylish – doesn't exactly make for the firmest handgrip. That said, a responsive touchscreen and dual control rings provide a very pleasing user experience, while the 24-72mm (equivalent) lens is one of the brightest around, courtesy of its f/1.4 to f/2.8 aperture range. Overall, this neat little snapper has the near-perfect balance of features, performance and pricing. While Sony's original RX100 is still going strong, this mark II update has now fallen in price to similar level at some retailers, making it the better buy. While it sticks to the same general idea of a 1in sensor and bags of technology inside a sturdy body, it adds a tilting screen to make awkward compositions easier, as well as a back-illuminated sensor for more efficient light capture. Other changes over the mark I that make it more appealing include a hotshoe and Wi-Fi with NFC. While it lacks 4K video and super-speedy burst shooting options common to more recent iterations (such as the RX100 V below), those simply after a reliable performer with simple point-and-shoot operation can save themselves a packet by opting for this slightly older alternative. The TG-5 splits from the other options in this list in that it's the only everything-proof model, being guarded against dust, water, drops and even being frozen. As with its many toughened rivals, its focus is very much on ease of use, but it still manages to stand out by having a spec sheet that shows its ready for just about any eventuality. From Raw shooting and 20fps burst capture to both 4K video and 120fps slow-motion recording in Full HD, the TG-5 is replete with clever tech, and most of this can be enjoyed in a point-and-shoot manner, without manual intervention. Don't let the sensor's 12MP pixel count put you off; Olympus knocked this back from the 16MP TG-4 precisely to help maintain image quality. The most recent iteration of Sony’s original 1in sensor-toting, metal-bodied compact, it feels slightly naughty to include this one here, but it's hard to argue against the fact that the RX100 V will give you some of the best image (and video) quality from a camera of this kind. While you can use it for point-and-shoot purposes and get reliably good results, there are further creative opportunities to explore here. Bells and whistles in this little beast include the ability to capture 4K video and shoot 40x slow-motion footage, while stills capture speeds reach 24fps in continuous burst mode. It also offers something most of its rivals are missing, namely a built-in electronic viewfinder. Sure it is pricey compared to other pocket options, and it does have its idiosyncrasies, but for those after a versatile snapper with a quality zoom lens this one’s hard to beat.